Tonights dinner wasn’t something I’d normally make when trying to eat more healthily, but I am participating in a forum monthly challenge and this months recipe certainly made Anthony smile. In fact, anything with sausages makes Anthony happy. The recipe is taken from Jamie’s Dinners – I halved everything to make dinner for two but even they were extremely generous portions. Take a large casserole pot and add a lug of olive oil and your butter. 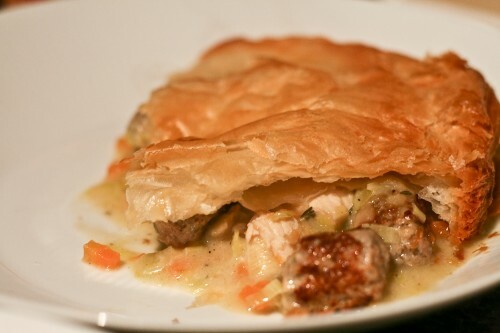 Pour the chicken mixture into an appropriately sized pie dish. Squeeze the meat out of the sausage skins, roll it into little balls, brown them in a little oil and sprinkle them over the stew. Roll out your pastry to about 0.5 cm thick. Egg wash the rim of the dish and drape over the pastry, using a knife to trim the edge of the dish. 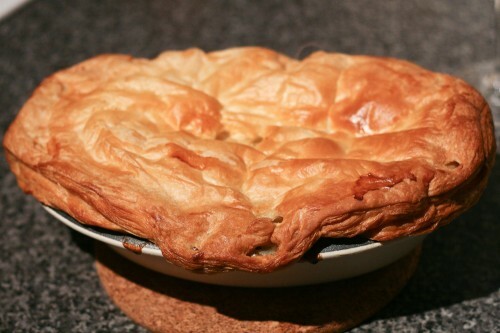 Egg wash the top of the pastry to make it go golden whilst cooking, then pinch it to crimp around the edges. I use the back of a knife to lightly criss cross the top – this allows the pastry to go crisp and flaky.